This match was played at Tynedale on Tues 25 Aug 2015. Tyndeale were an IOnter team, Morpeth a Major team, which meant Tynedale started with 1½ points and needed a further 1½ to win. Morpeth needed 3 points. Tim was first to finish, gratefully accepting an early draw after a torrid advance French. From there it went downhill, with Alex, Bruce and Derek all losing. This match was played at Morpeth on Tues 29 Jul 2015. Both teams were at the same handicap level, but because Tynedale grading total was higher, we needed to win 2½-1½ across the boards. Sadly Jo Pharoah did not appear, so Morpeth started 1 down. Not a very auspicious start to the Summer KO. We outgraded Forest Hall marginally, so nedeed 2½ out of 4 to win. We failed to trouble the scorer, lost 0-4, and must now defend our plate trophy. Personally, I made two stupid mistakes, first I set the board up the wrong way round, so I played white and Martin played black. By the time we realised the error it was too late to change, but somewhat flustered I played an illegal move, pawn on g4 takes pawn on e5, and was forced by the touch a piece move it rule to actually play g4 to g5. This cost me a good opppurtunity, and Martin outplayed me in a tight ending. The Tans may not have won last night at Gosforth, but we did pick up a trophy. 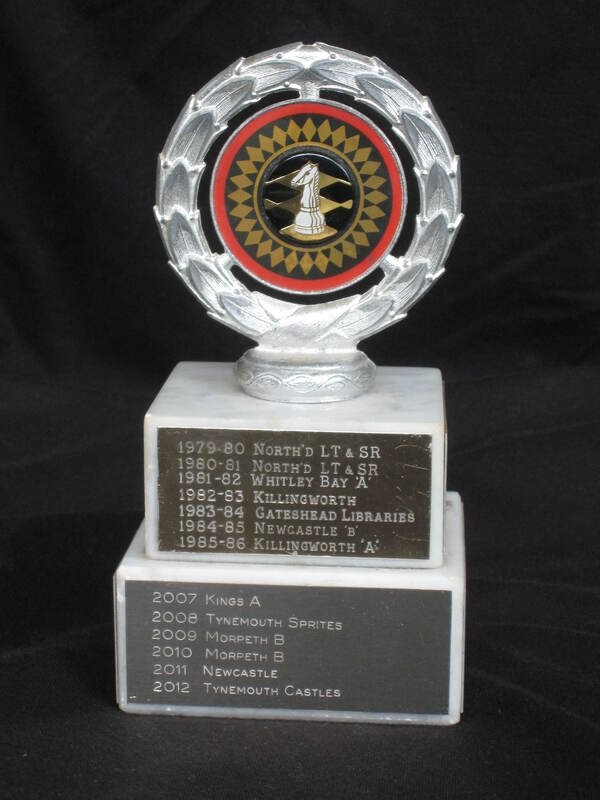 This is the Northumberland Chess Association Summer Knock Out trophy, won last summer by Tynedale. I’ve been looking trough the records to see who played, and the team stalwarts were Derek Blair, Jeremy Handley, Steve Larkin and Phil Taylor, with cameo appearance by Tim Wrigley and Alex Ashworth. Steve Larkin produced a report about the final (Summer KO Plate Final Report) and I am now reproducing Dave Walshaw’s report about the earlier rounds. Home win, but no further details forthcoming. The grades are the January ones, and therefore incorrect, leading to the top two boards playing out of order. Morpeth spotted this after the match but decided not to lodge a complaint on the grounds it was accidental. Kristian Mills was expected for Gosforth but a phone call established he wasn’t coming minutes before the start so their boards 3 and 4 moved up. Dave Turner(104) 1-0 Brian Orde(83). The result was 2:2 which gives us a win on handicap, I think, but please see note below. As you can see, board three played the wrong colours so that we ended up with 3 blacks. It was a genuine mistake which I only noticed after the game, and their team captain (Jeff Bentham) didn’t spot either. Hopefully, you will decide that the result stands because the winners were disadvantaged rather than making us play the match again! As both sides were intermediate teams, Tynedale won. Tynemouth the lower rated team wins. With Tynemouth a Minor side and Tynedale an intermediate one, Tynemouth enjoyed a 1.5 handicap advantage, so Tynedale would have to win 3-1 over the board to take the match. Anything less would mean defeat. The first game to finish was board 4, which was the most curious game of the evening. Bob arrived 10 minutes late and proceeded to set about Phil in serious fashion, building a very strong kingside attack and going four pawns up in the process! However he failed to find the critical move which would have sunk Phil and the game turned into an endgame with Bob’s bishop, rook and 8 pawns against Phil’s bishop, rook and 4 pawns. At which point Phil won on time! Contributing to this state of affairs was the fact that Bob’s clock had been set to a different time from Phil’s, though there was no denying that he had used up his time. So Tynedale went ahead 0-1. So Tynedale, needing 3 points to win the match, failed by the narrowest of margins … or did they? A phonecall from Dennis White the following morning revealed that he had made a mistake and the Tynemouth side were not a minor team after all but an intermediate team. Since Tynedale were also an intermediate team, it meant that the result of the match had to be decided purely over the board. In consequence Tynedale, from being the losers by the narrowest of margins (3-2.5), became the winners by the narrowest of margins (1.5-2.5) and, for the first time since the writer of this article has been involved with the club, won a Northumberland title – the 2014 Summer KO Plate winners! Hooray!